One of the most popular colours in the garden, pink mixes easily and always looks fresh. Dahlia 'City of Leiden':Apricot-pink, cactus flowerheads top dark stems, which rise above bronze-flushed foliage, putting on a great show from midsummer onwards. A reliable performer, it is relatively compact, so can also be grown in pots on the patio. Good for cutting too. Grows to 60cm. 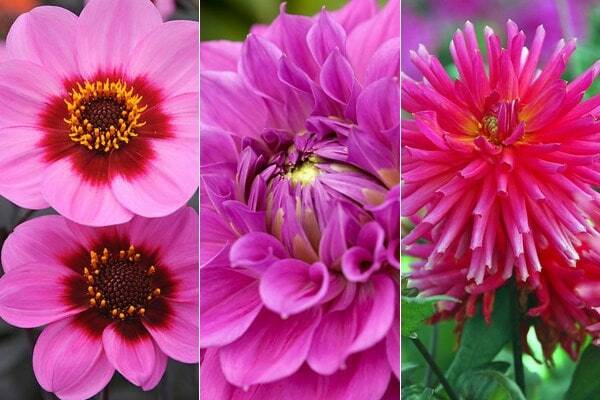 Dahlia 'Happy Single Wink' (PBR):Iridescent lilac-pink ray-florets, each with a rich plum base, surround the central disc, forming charming flowerheads that are highlighted against the backdrop of the deep purple-bronze foliage. Excellent in patio pots. Grows to 60cm. Dahlia 'Gallery Rembrandt' (PBR) (Gallery Series)The colouring of this decorative dahlia is sublime. As the flowerheads open, the innermost 'petals' are a creamy mango, but as they age they turn sugar pink. They are great for cutting, and this will encourage more flowers to come and take their place - but make sure you leave plenty for the border too! Grows to 40cm.